A completely new method of treating rheumatoid arthritis that does not involve drugs may be on the horizon. In 2016, a team of researchers from several countries, including the U.S., reported that stimulating the vagus nerve with an electrical pulse appeared to inhibit the production of some of the inflammation-promoting proteins – called cytokines – commonly seen in people with RA. The vagus nerve is located on both the left and right sides of the body and runs from the brainstem through the neck into the chest and abdomen. One of the longest of all the cranial nerves, the vagus nerve serves several important functions. It regulates the heartbeat, breathing and sweating. It helps keep the larynx open during breathing and enables us to speak. It also connects to the stomach and gut, telling the brain when we’ve ingested food, then signaling that it’s been digested and triggering the brain to empty the digested food from the stomach into the intestines. It also controls bowel movements. Vagus nerve stimulation is most often used to treat epilepsy that does not respond to drug therapy. It is also used as a means of treating severe depression that has not responded to treatment with antidepressant medications, and it is increasingly being tried as a potential treatment for other conditions, including multiple sclerosis, pain, headache, Alzheimer’s disease, inflammatory bowel disease and RA. The study, headed by physicians at the University of Amsterdam in the Netherlands, involved implanting a small medical device similar to a cardiac pacemaker under the skin in the chest wall and connecting wires from the device to the vagus nerve in the neck. The device, which is really a small electrical generator, was programmed to deliver small electrical pulses to stimulate the nerve up to four times each day. They describe costly and intrusive procedure involving an implant. CES, specifically Ces Ultra, can achieve the same result at fraction of the cost and in noninvasive manner. The CES Ultra does not make claims as to alleviation of pain. 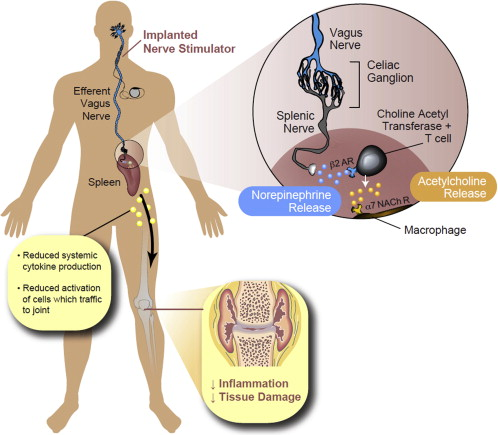 However this article shows how inflammation and symptoms of arthritis maybe reduce by vagus nerve stimulation. The CES Ultra targets the vagus nerve. This entry was posted in Alternative Health on November 30, 2017 by cesadmin. Vignette # 2: Melinda, a sixteen year old Caucasian female, had a long term history of depression and had been in counseling without much noticeable success. Melinda reported that she had experienced feelings of sadness for “….as long as I can remember” and when initially evaluated by the psychologist displayed a very flat affect with almost no emotion and a monotone voice. The psychologist was extremely concerned that she might be suicidal because she had reported thoughts of self harm. On a measure of depression she scored at the 77th percentile, while on a measure of anxiety she scored at the 73rd percentile with present moment (state) anxiety and at the 96th percentile with general proneness (trait) anxiety. On the Wechsler Adult Intelligence Scale-Revised (WAIS-R) Full Scale intellectual functioning was in the Average range (Full Scale IQ = 107) with verbal area functioning in the High Average range (Verbal IQ = 111) and performance area functioning in the Average range (Performance IQ = 107). After thirty days daily usage of at least forty-five minutes with the CES device she was again administered a psychological evaluation. The psychologist observed a much brighter affect with much smiling and talking as well as her initiating conversation during the session appearing almost as a different person. On the same measure of depression Melinda scored at the 1st percentile, while on the same measure of anxiety she scored at the 2nd percentile with present moment (state) anxiety and at the 9th percentile with general proneness (trait) anxiety. This entry was posted in Inflammation on November 9, 2017 by cesadmin.